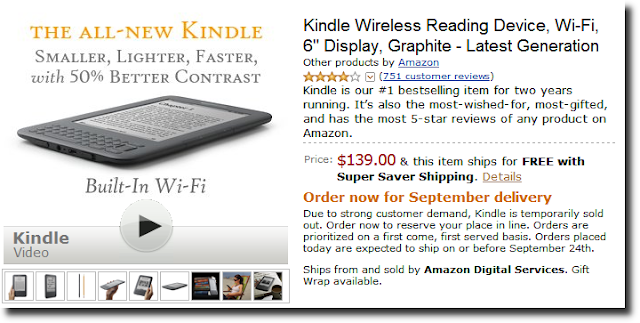 I had blogged (The Kindle - Still Sold Out) that the new Amazon Kindle e-book reader sold out within a week of its launch. It continued to be sold out till Sep 16, showing an estimated ship-to date of Sep 20. Now, on the 17th, it shows up as in stock. Kindle page on Sep 10. Estimated ship date: Sep 24. 1. 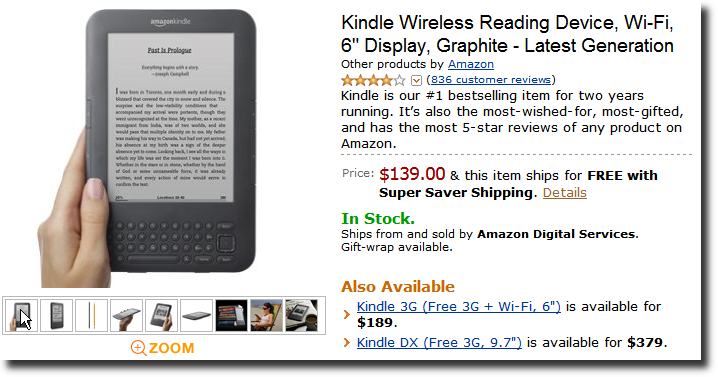 Amazon has been able to ramp up production of the Kindle, and therefore been able to clear the order backlog. 2. Amazon has moved production from other models to the 6" Wi-Fi model, which has been the biggest selling Kindle. 3. There have been cancellations that have resulted in a shortening and then elimination of the order backlog. 4. Fewer orders have been placed in the recent weeks. The estimated shipping date that Amazon had been stating could have been based on an inflow of orders that turned out to be higher than what they had estimated. It will be interesting to note how the media interprets this event.